WAB Converter Tool allows a user to transfer multiple Windows Address Book contacts into Outlook PST, CSV format. While conversion of WAB to PST, CSV format the software export all address book contacts attributes with proper formatting. WAB Converter tool provides an instant preview of all the contacts with their attributes. A user can view and edit the contacts information like business, personal and additional (contact name, number, address, etc). Export edited information into PST, CSV formats. WAB to PST Conversion tool allows a user to add Windows Address Book of any size. The software easily exports WAB to PST, CSV of any file size without making any changes in contacts attributes. 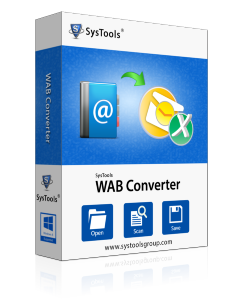 The WAB Converter software provides an advanced search option to filter any contacts instantly. Search any contacts by entering name (first, middle, last), email id. Easily convert WAB to PST, CSV in Windows. Instantly access your contact in Outlook Email Client (2007/2010/2013 or 2016). Convert the contacts that you have in Excel format. Complete standalone application and does not need any external application for the conversion process. 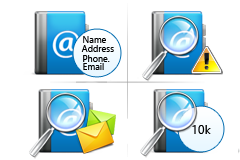 Even if you don't have Outlook Express you can still be able to view all your contacts for free. In more newer version of Outlook i.e Outlook 2013 (.pst). The application also gives you the ability to save all your contacts in MS Excel file format. Scan for file corruption and instant preview of all the contacts. The software also gives you the liberty to save the converted contacts in ASCI or UNICODE format. Gives you the ability to edit the contact. The prerequisite of the tool is that you need to have Outlook email client installed on the machine where the .wab to .pst conversion process is taking place. What is a WAB File? How to migrate to Outlook? WAB or Windows Address Book contains all contact information that you have stored in Outlook Express email client most likely created when you had XP as your Operating. So if want to migrate your contact from XP to Windows 7 or newer version you can easily do using this online WAB converter. What about the corrupt WAB files? The software is mainly designed to work on healthy files, so if have corrupt WAB files then we recommend you to use our WAB recovery tool for the purpose. The WAB Converer software comes very handy for speedy conversion of all my Outlook Express contacts. After moving to Windows 7 operating system recently I have to move my wab contacts to the latest Outlook PST format. The WAB to PST conversion tool easily run on any Windows OS. The task become seamless all thanks to your software. I run small business which consist of several contacts, I faced the deadly problem when I need to move my outlook express contacts to outlook. I was losing hope because I didn't find any solution which can convert my wab contacts to pst. A hearty thanks to wab converter guys whose software made my problem solved within a minute.